Your hosts, Ann and Ante, warmly welcome you to La Bicicletta B&B! 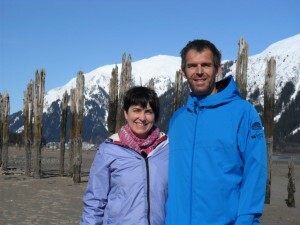 Ann and Ante are both avid cyclists, skiers, travellers and outdoor enthusiasts. They will be sure to make your visit to Whitehorse a memorable one. Ante biked around the world from 1991 to 1996, cycling for peace and democracy in Croatia. It was halfway through his third year of cycling that he met up with Ann. They peddled along the West Coast of Canada and the U.S., enjoying four months of wind and rain and at least three days of sunshine. In Whitehorse, Ann works as a public health nurse and Lactation Consultant (IBCLC). Ante is a social worker, he has published a book about his travels but he spends most of his time doing carpentry, making endless coffees and spinning stories. They have three children who are growing up to be great B&B hosts. We hope you’ll come and stay, enjoy a few stories yourselves and share some of your own travel adventures with us!